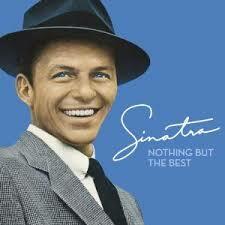 Today is the 100th birthday of the “Chairman of the Board,” Francis Albert Sinatra. Ol’ Blue Eyes was born this day in 1915 in Hoboken, New Jersey. He was the child of Italian immigrants, and he grew up working in his parents’ tavern in Hoboken, serving drinks and occasionally singing a song on top of a player piano. He would do this for the rest of his life, although the venues for drinking and singing ultimately moved out of that tavern and into recording studios, theaters, and Las Vegas casinos and nightclubs. Frank Sinatra never learned to read music, but he could take a look at a lyric sheet, hear a pianist play a few bars, and make that music come to life. Frank Sinatra wasn’t just a singer. He was a poet, an actor, and a cultural force. By the late 1930s, he was a regular singer on New York City’s WNEW radio during its weekly “Dance Parade” show. On the eve of World War II, Sinatra was at the top of the Billboard charts singing first with the Harry James Orchestra and then with the Tommy Dorsey Orchestra. And when the greatest generation returned from Europe and the Pacific in 1945, Sinatra became their voice, recording such classics as Young At Heart, I Get a Kick Out of You, and In The Wee Small Hours of The Morning. Frank Sinatra’s range was limited. He was no Luciano Pavarotti. But his depth of feeling and understanding had no limits whatsoever. When you would listen to him sing, he would touch your heart and your soul. There is a wonderful Italian word, Sprezzatura. It means a style of nonchalance … a purposeful and studied nonchalance … a very casual elegance that appears effortless. When Frank Sinatra would sing, he personified Sprezzatura. His voice sounded elegant and his singing apparently effortless, but when you heard it, you knew that all the grace and elegance was the product of not only talent but hours of planning and design. Before he would ever sing a song, Ol’ Blue Eyes would read the lyrics to himself over and over again. And then he would speak the lyrics into a microphone, before he ever sang them. And finally, when he knew the message he was going to convey, he sang it. Boy did he sing it! And so on his 100th birthday, I am going to have Sinatra music playing in the background in my car, my home and my office. My favorite Sinatra song is All My Tomorrows Begin With You, but there are about a hundred others I love almost as much, and I look forward to hearing them today. So Happy Birthday, Frank! Thanks for doing it your way for 100 years. Nick McCall: One of my favorite books on Ol' Blue Eyes is "Why Sinatra Matters," by Pete Hamill. It's worth a read, and I may have to dig up my copy and read it again this weekend in honor of his centenary. A very evocative reminder, Bill, of the Chairman of the Board!